With 7.7 million new cases of dementia diagnosed each year, it’s likely you’ve been personally affected by the disease through a family member or friend. Dementia and Alzheimer’s disease diagnoses can cause fear, denial, and grief due to the lack of understanding about how the symptoms develop. However, when public figures who we admire reveal they’re battling an illness, it often brings much-needed attention to a disease that affects millions, and relief to families grappling with the disease in their lives. These public faces have helped to bring more awareness to dementia and Alzheimer’s by sharing their own stories. Their advocacy has helped to raise money for research, care assistance, and early detection. In November 1994, 40th president Ronald Reagan shared his Alzheimer’s diagnosis in an open letter to his former constituents. Reagan used his prominence to bring attention to the disease, dispel the stigma that surrounds Alzheimer’s, and comfort affected families. Following his announcement, Reagan and his wife Nancy founded the Ronald and Nancy Reagan Research Institute at the Alzheimer’s Association. Together, the Reagans’ raised millions of dollars for Alzheimer’s research, and Nancy famously advocated for stem-cell research as a cure for the disease. Sandra Day O’Connor is the first woman to serve on the Supreme Court. After 24 years, she retired from her seat in 2006 to care for her husband, John, who was battling Alzheimer’s. John passed in 2009. Nine years later, in October 2018, O’Connor announced her own dementia diagnosis. She used the announcement as an opportunity to express her decision to leave public life and enjoy time with friends and family. 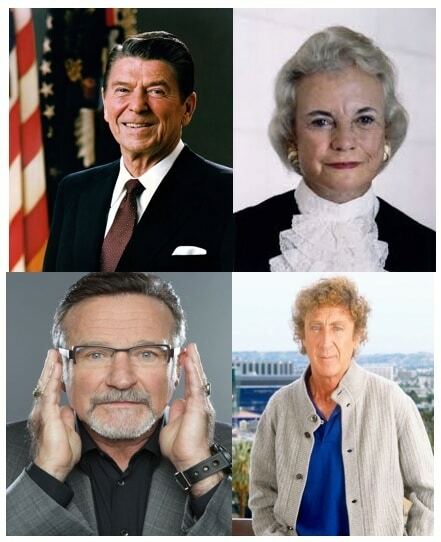 Robin Williams and Gene Wilder were both beloved comic actors whose starring roles in films like Mrs. Doubtfire and Willy Wonka and the Chocolate Factory respectively made them household names for adults and children spanning generations. A reported Parkinson’s disease diagnosis was the catalyst for Robin Williams’ suicide. However, his autopsy concluded he lived with an unusually severe case of Lewy body dementia (LBD). In a 2016 editorial in the journal Neurology, Williams’ widow, Susan Schneider Williams revealed he was having problems with paranoia, delusions, insomnia, memory, and high cortisol levels. In an essay for ABC News, Wilder’s widow Karen remembers the signs signaling something wasn’t right with her husband—uncharacteristically lashing out at their grandson, losing depth perception, or forgetting the name of one of his most famous films “Young Frankenstein.” She also recounts the difficulties she faced as a caregiver, recalling a time her husband fell on the patio and couldn’t get up. She got him to the pool to float him to the other side where there were steps and a railing to assist him. Karen Wilder allowed the Alzheimer’s Association to use her husband’s Willy Wonka character in a video campaign, the “Pure Imagination Project” aimed to bring greater awareness to the disease. Writer and actor Lauren Miller Rogen and her husband, actor Seth Rogen, founded Hilarity for Charity in 2012 to increase the awareness of Alzheimer’s disease among millennials. Inspired by Lauren’s long family history with the disease and her mother’s early on-set diagnosis at 55, the organization uses its star power to engage younger generations in the fight against the disease. Notably, their successful variety show has raised over $10 million. “Seth Rogen’s Hilarity for Charity” was released on Netflix in 2018 as an avenue to reach more millennials with popular comedians like Nick Kroll, John Mulaney, Tiffany Haddish, and The Muppets. Though there is no cure for dementia and Alzheimer’s, it is possible to live an enriching life despite the diagnosis. Familiarize yourself with the early signs of dementia. If you recognize symptoms in a loved one, encourage them to see their physician sooner than later. If you’re a caregiver, make sure you are taking care of yourself, too. Aegis Living offers a robust memory care program for people living with dementia and Alzheimer’s. Our Life’s NeighborhoodTM program is designed to improve the quality of life and increase enjoyment for people living with memory loss. If you’re interested in learning more, call your nearest Aegis Living community to speak with one of our directors about memory care.